Among the exceptionally fertile vineyards in the village of Els Pallaresos emerges the old owners' house and -back in time- excellent wine producers: Casa Bofarull. The huge and rustic 17th century house becomes in the hands of the architect Jujol in an elegant, comfortable and attractive mansion. The architect builds a cosy balcony where the eyesight enjoys itself with the large vineyard fields. A great tower stands above the building, taking over the house, the hacienda and the town, turning into a representative symbol of the village. Crowned by the guardian angel, a sculpture made by Jujol himself, with its large and trimmed wings, it protects the properties and its inhabitants, whilst it always fights against the wind, acting as a weather-vane. A spectacular staircase goes across all the building, with a unique handrail in the whole world, another brainwave by the architect Jujol. The master hand as a painter delights us with an interpretation of the four seasons of the year, captured on a wall by Jujol himself. Endless details and furnishings adorn the house and the ancillary buildings. The winery door is wonderful. The old farming tools turned into sublime iron fittings complementing the main door of the mansion. It is a wonder by a great artist-architect. Here we can find Jujol as a painter, sculptor, craftsman, designer and always as an architect. "Problem: you shall neither talk about those things you love nor about those things you are so excited with. Otherwise: shall you see it vanishing? On the other hand, though: what to talk about, then?" It's been many years since I've been visiting Casa Bofarull and there's always something different. The house breathes and lives the air of Camp de Tarragona; it reflects and expands the year, the season, the month, the day and time during the visit: The time and the material nature are not divisible. So, after each visit, my experience and my memories of the house are different; nevertheless, in an invariable way, during or after the visit I am happier than before. I think Casa Bofarull is lately -and evidently- providing accommodation and material shelter to its inhabitants, but also (material shelter as well) to the inhabitants of the celestial world. The Casa Bofarull hosts an indissoluble fusion of the heavenly world and the earthly world, in Camp de Tarragona. 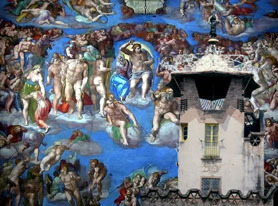 The Sistine Chapel, in a certain way a unique invitation to become visible to the inhabitants of thus heavenly world, displaying their physicality on the walls, sitting on the ledges, between the pillars, is a splendid testimony that the sky, the empty space (and therefore available according to the architects) is already completely busy, like the Earth. In Casa Bofarull's tower, a place where, as it rises up it mixes the air with materiality in an increasingly more convincing way that one gets closer to Heaven, remnants of dishes, cups, bottles and a jug on some tablecloths have been prepared (the white lining of the hip roof). It is a laid table with useless remnants that show the monumental features of the earthly world to the inhabitants of Heaven. The roof-table is an invitation in proper order to share both worlds, a generous and innocent offering, perhaps similar to the one children make for the Epiphany night. 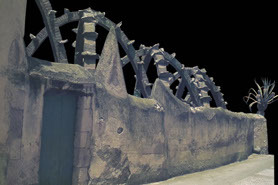 Unlike the tower, the wall separating the washing place and its covering structure, placed at ground level (unlike the tower), embodies relations with underground and gravitational forces that keep men "smashed against the shell of the Earth". The restrained violence, tied to these two elements, wall and structure, implodes the wall and modifies the structure. In the former case appear some spikes that distort its vertical edge, and, in the second case, stones that come up from the ground and get mixed like rings among the arcs. If the Tower represents hospitality and an invitation offered to the inhabitants of the Heavenly world, the laundry represents the fight to save the man from the dark forces breathing under the plaster. I sincerely hope that this slight change of "status" of the house is a success in every way possible. Among the interventions of the architect Josep Maria Jujol (Tarragona) on buildings already existing (either modifying them to a large extent or just "jujolizing" them through some of his most personal touches) it would be precise to put this Bofarull's manor at the top of the list in which, through successive interventions, the architect leaves (between 1913 and 1931) a shocking sample of his extremely personal understanding of the ‘fine arts fact’, reaching one more time the authentic Gesamtkunstwerk or 'total work of art'. The Angel Tower would be specially remarkable in Casa Bofarull, with its 100% 'jujolian' handrail; The angel-vane itself over the pyramid-pedestal, bearer of the mythical 'escudella' and 'porró' (jug), indefinitely represented in books; the exceptional main door with a sculptural usage of unused farming implements and a treatment of wooden elements anticipating the discoveries that fifty years later, Lucio Muñoz, the prominent representative of the Spanish artistic avant-garde, would capture in his works; modified paintings in one of the lateral reliefs, including the hugely original balcony; the Neo-Mudejar gallery as well as the outdoor yard fountain, located in a lower level with a triangular aperture on the wall fitted with a praiseworthy iron grille, and other subsequent iron, wood, painting or glass details, whose detailed description would mean an endless note. Inside the house, the small office-study with some of the most valuable -and strange- pieces that one can still nowadays contemplate of the 'jujolian' furnishing, a sample of his prodigious inventiveness also in the field of design. Completing the whole set, several works of lesser value only because of its "service functions" condition, specially the pergola over the laundry sink, formed by a series of vaulted arches, the so much loved by Gaudí "balanced style", his master and greatest admirer. The visit to the village of Els Pallaresos causes the finding of other extraordinary samples of the talent of this great artist and architect, whom I've been for ages considering and proclaiming again and again as one of the most subtle and provocative, awesome and refined, unprejudiced and inventive figures of all the 20th century European art. In Casa Bofarull, what's profane and what's Christian share time and space: there is no distinction between Jujol's actions that adapt and update the program of the house -work and rest-, and those showing willingness to liturgy. If we are welcome with the Hail Mary at the entrance, at the end of the garden and in a strict horizontal axial character the sermon is awaiting for us, by the priest of the field, insect-dragon over the fountain, ready to sanctify the tour over Casa Bofarull. But if religion provides the house a narrative unity, movement is, as the final shot of the world of the living and the living world of the countryside, who can make the maxim from Earth to Heaven come true: the stones climbing up the basement of the administrators' house till the covering summit; farming tools that infiltrate and squeeze between the threshold of the main door; engravings that mimic the erratic flight of small birds or maybe the shape of clouds; sashes marking the change in thickness of the back facade; a snake guiding us from the bottom of the staircase tower becoming a basket and collecting the movement of small dragons playing over the bay window on the top of the attic; the yellow color of the sun and the blue color of the sky as tones present in woodwork, ceilings or walls. The whole universe is close to our eyes. Form, function and speech are shown at Casa Bofarull through Jujol's hand, just like that architecture that, due to its nature, becomes necessary.